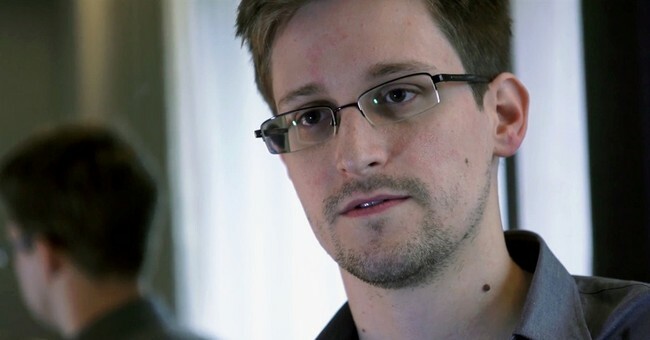 It would make things so much easier for everyone if Edward Snowden were working for China. And that's certainly a possibility. His decision to flee to Hong Kong -- a Chinese vassal -- was an odd one, given that China is hardly a bulwark of transparency and civil rights. It's a bit like complaining that Boston is too Catholic and then moving to Vatican City in protest. Then there's the nature of the crime itself. Informed sources I've spoken with are generally aghast by what they say is the scope of information Snowden stole, material some believe he couldn't have gotten by himself. That doesn't mean he's the Manchurian IT Guy, but it does cause some to wonder whether he had help -- and from where. Last, there's the nature of the disclosures. The initial story broke at precisely the moment President Obama was meeting with the new Chinese president, undermining Obama's effort to press the issue of Chinese hacking (a practice Snowden seems mysteriously indifferent to). Soon thereafter, Snowden went from "whistleblowing" on alleged domestic data-mining abuses to leaking embarrassing information. Indeed, the latest disclosures seem perfectly timed to vex America and Britain at this week's Group of 8 summit. It's one thing for an American to claim it's his patriotic duty to expose a breach of trust with the American people. It's another thing entirely for an American to unilaterally decide what foreign espionage America or its allies should or should not be doing and then divulge the bits he doesn't like. We elect a president and a Congress to make that kind of decision. It's plausible that Snowden was shocked and dismayed to discover that the National Security Agency was monitoring Americans on U.S. soil. Are we really to believe, though, that he was shocked that the NSA was monitoring foreigners on foreign soil? That's what the NSA does. Still, the Chinese dupe theory depends on an enormous number of assumptions, starting with the notion that the Chinese are that sophisticated. Also, while it's always fun to ask cui bono after events like this, it's rarely all that illuminating. An easier explanation is that Snowden is a fool. I don't mean he's stupid. All of the pundits and politicians attacking Snowden as a high school dropout sound silly. First, it's not true (illness caused him to miss too much school, so he later got his GED instead). Second, this guy ain't dumb. You don't get and keep the jobs he had if you're a moron or a slacker. No, when I say he may be a fool, I mean he may be a fool for love -- love of an idea. When you look back on the various spies and turncoats in U.S. history, many acted out of a foolish loyalty to an idea. The most obvious examples are the many communists who betrayed America during the Cold War. Alger Hiss and the Rosenbergs weren't Russian nationalists at heart, they were (very smart) fools for communism. One thing that comes through in Snowden's remarks so far is his affection for a set of ideals that transcends nations. He claims he did what he did to protect the "Internet freedom and basic liberties of people around the world." In a Q&A session with readers of the Guardian, Snowden strongly suggests that foreigners be granted rights under our Constitution. "US Person/foreigner distinction is not a reasonable substitute for individualized suspicion," he asserts. "Our founders did not write that "We hold these Truths to be self-evident, that all U.S. Persons are created equal." I suspect that most Americans do see a real distinction between foreigners and Americans. In short, it looks like he sees himself as a digital-era Diogenes. Like Diogenes, he sees himself as a citizen of no place, save a citizen of the (cyber) world. One irony is that Obama campaigned on similar ideas. In his 2008 Berlin speech, he spoke to the German people as a "fellow citizen of the world." His analysis of the Cold War was a bizarre extended metaphor about the evils of "walls" between peoples. Snowden says he delayed divulging NSA operations because he hoped Obama would follow through on that philosophy. But Obama disappointed Diogenes. Obama discarded some of his cheap cosmopolitanism when he learned it might come at the cost of American security. If Snowden were a traditional spy, it'd be very easy to put him in a traditional box. But my hunch is that he represents an altogether more complicated challenge.